In 1954 as events were conspiring against William Gaines', he was still determined to be at the forefront of new developments in comic reading. As a result and hot on the heels of the 3-D craze sweeping U.S. movie audiences, comic publishers were experimenting with applying the same technology to the printed page. 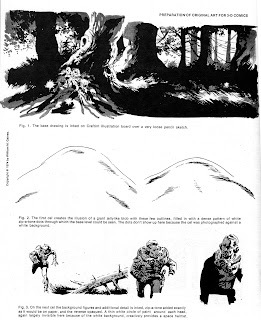 The first 3-D comic with the imaginative title "Three Dimensional Comics" had sold over a million copies the previous year and it's inventor Leonard Maurer in partnership with his brother Norman and Cartoonist Joe Kubert (yes - THE Joe Kubert) had hopes of licensing the technology to other comic publishers. That was until the ever resourceful Gaines who was already the owner of a StereoRealist camera, made a search of patents and discovered the whereabouts of the original inventor of stereoscopic cartoons for newspaper repro, who had taken out a patent for precisely this procedure in 1936. Gaines swiftly made contact with the now frail and elderly Freeman H. Owens and bought the patent off him for the princely sum of $100.00. 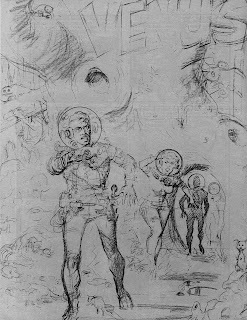 He then initiated a patent infringement suit against all his rivals and whilst the case was ultimately dismissed as being vexatious in the extreme the damage was done as regards the ambitions of Maurer and his partners and 3-D comics were destined to become yet another in a parade of developments which in retrospect seem more like gimmicks than real pushing of the boundaries. However Gaines' footwork did enable him to exploit the medium with his own band of highly talented creatives and 2 E.C. 3-D comics were published. The first titled simply 3-D EC Classics was a collection of four stories from across the range of EC's output. The second collection Three Dimensional Tales From The Crypt of Terror reprised a selection of stories from EC's horror output. 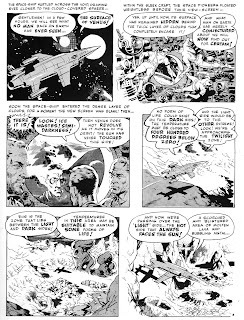 A third collection devoted to the best of EC's science fiction comics was prepared but never saw print. 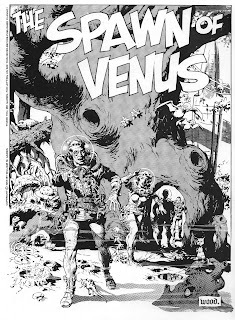 Eventually the four stories were reprinted in the EC fanzine Squa Tront and Wally Wood's Witzend, where Wood's masterful treatment of "Spawn of Venus" finally made it's first appearance. A note on the production process un dertaken by the artists concerned is worth running past you. 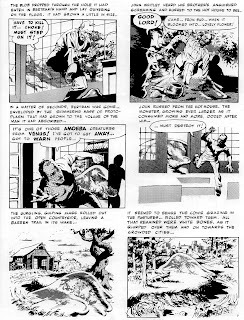 The first image you can see is a page of original artwork from Wood's "V-Vampires" which was arguably the most successful of the stories to see print. As you might be able to discern what you are in effect looking at is a series of cels with artwork on each cel representing a layer with the final layer being the base board background artwork on which all the other cels are affixed. The procedure for the artists in volved was painful in the extreme. Firstly the artist would pencil the page on an ordinary sheet of art paper with holes punched into the top margin which he would affix to an animator's peg board. When the penciling was complete he would note down next to every item drawn what layer it would ultimately appear on. You'll notice the numbers on Woody's penciled page second image down. Then he would start tracing onto celluloid usin g the peg bar to affix the pre-punched cel sheet so that everything remained in register. All figures and objects on that particular layer are thus traced onto the cel. When each layer of cel inking is complete he repeats the process apart from the last and deepest (stereoscopically speaking) which is inked up on the original sheet of art paper. But that's not the end of the process for the artist, as each item must be rendered opaque while it's surrounding cel remains transparent. To achieve this the artist then needs to flip over each cel and paint on the reverse side of each drawn element with white paint again much in the manner of the trace and paint department of animation studios for much of the past century. Tedious in the extreme - what!? 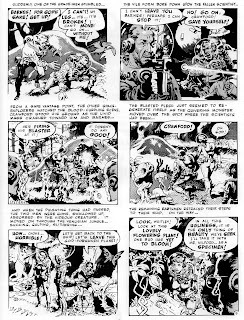 And of course for each level (most publishers would settle for three or four but EC went for five to six), it was necessary to include loads of extra detail that wouldn't normally be required in a regular comic, the kind of detail that disappears behind objects but in 3-D comics needs to be drawn. The final artwork was then sent off to repro where it would be shot as it was delivered and then at the next stage each layer would be shunted a bit to the right, the further away the background elements the deeper the shunt. Then one photo is printed in red and the next is printed in green and the resultant page is viewed through those wacky looking red-green 3-D glasses and an illusion of 3-D is experienced by the viewer. 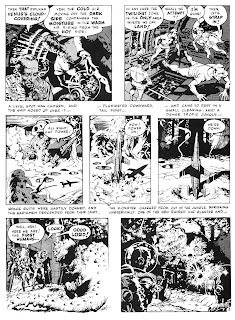 An absolute nightmare to draw but the results of the best comics and in particular Wood's "V-Vampires" is truly impressive. Anyway here's "Spawn of Venus", see if you can spot the panel where the charming street scene from the third image down appears. You're really giving us an advent calendar of glorious comic goodies, Peter! 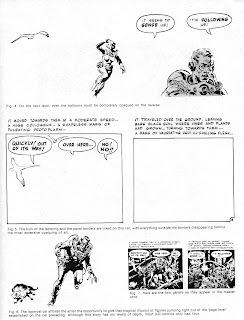 I originally encountered Wally Wood's artwork via the b&w Daredevil reprints in Smash! (or was it Pow! ?) 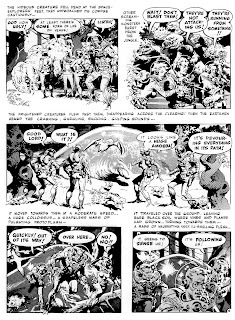 and, later, his SF stories for EC reprinted in Ballantine's "Tales of the Incredible" book. Nobody could match him for drawing girls in spacesuits! 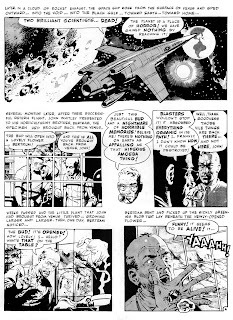 I think my first introduction to Woody's artwork was in the pages of the Ballantine Mad reprints and it was just love at first sight, beautiful work and each subsequent discovery it just got better as I discovered his Daredevil, Thunder Agents and the best of all his EC sci-fi artwork. I wish I'd still got the 3-D EC Classics comic with his "V-Vampires!" in it. I rather foolishly sold it along with the "3-D Tales from the Crypt of Terror" in the naive belief that it would eventually see print as one of the Russ Cochran boxed sets. Ironically it was only the EC 3-D comics that never got reprinted by Cochran, the original plan was that all three would be reprinted in both 3-D and regular format but I think the logistics must have been a deciding factor in the project never happening. Fascinating stuff who knew such work went into these pages! 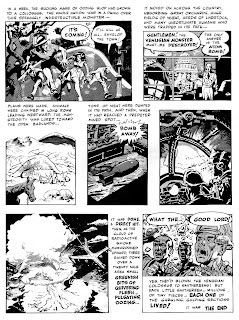 Always great to see some Wally Wood art. Thanks again Peter. Is this story new to you James? I'm always in a bit of a dither wondering if half this stuff is way too familiar but I still recall the sheer joy of reading this story the first time around. The original version by Al Feldstein was pretty good too. Think so, though I think I may have seen the splash page in something before a lot of the stuff on here is new to me although I'm aware of EC and a lot of the creators. Really enjoying reading them here. Have any of you guys spotted the panel with the street scene yet? Street scene from image three down that is. >Have any of you guys spotted the panel with the street scene yet? Isn't it obvious? 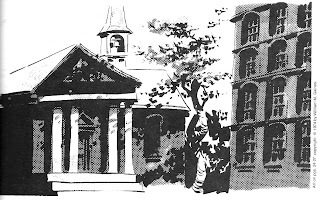 The first panel of the last page ("In a week, the sucking mass of oozing slop..."). You really can't see much of it in the 2-D flattening, can you?